Facts about Impatiens Flower (Plant), "Scientific name for Impatiens walerana". Impatiens Flower (Plant) is usually used as summer bedding plant. The Impatiens Flower (Plant) is also known by the name "Busy Lizzie". The term "Impatiens" is a Latin word that illustrates the way the seeds of the plant shoot out of its pods when they ripe. Nature has made the surface coating of the Impatiens Plant seed in such way that even a slightest touch or pressure can make the seed pod burst and scatter its seeds. The Impatiens Flower (Plant) shows best growth in shade and moist sites. Impatiens Flower (Plant) is propagated through transplants, mostly after last spring frost. The Impatiens Flower (Plant) are grown in humus-rich, moist and well drained soil. The planting site should be provided with shelters to keep the plants away from being directly exposed to winds. The Impatiens Flower (Plant) also grow in shady locations, places not having a direct sunlight exposure. Most of the Impatiens Flower (Plant) are advised to grown with a space within them, but its opposite in case of Impatiens. The closer they are planted, the taller they grow. The fully grown up Impatiens Flower (Plant) height may vary anywhere between 6 to 30 inches (15.2 to 76.2 cm) tall. To keep the Impatiens Flower (Plant) low to the ground, plant them with a spacing of 8 to 12 inches (20.3 to 30.4 cm). This is the way they should be planted to make a flower bed out of them. While transplanting, if compost isn’t available, a slow-release fertilizer can be used to help the Impatiens Flower (Plant) cope up in new soil conditions. 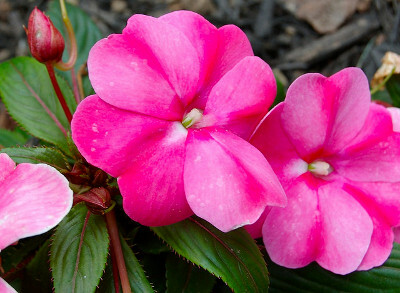 Sterile and soil-less mixtures are recommended if the Impatiens Flower (Plant) are grown in containers. Impatiens Flower (Plant) should be watered regularly. The soil needs to be moist, not too wet. If the interval between successive watering sessions last longer, the plants dry out. Water deficiency leads to falling of leaves. If the Impatiens Flower (Plant) are over watered, fungal infection starts from the roots and spreads to the leaves. If Impatiens are grown in containers, they may need more water than the plants grown in regular soil.